College Cup is a year-long contest in which collegiate anglers can win thousands of dollars’ worth of Lowrance HDS Gen-2 Touch units by logging sonar data used to create custom fishing maps with one-foot contours, a vegetation-map layer and a bottom-hardness map. Map & Win! is a new contingency-prize program that awards a Lowrance HDS-12 Gen2 sonar/GPS unit to any College Cup-registered team that wins an FLW or B.A.S.S. 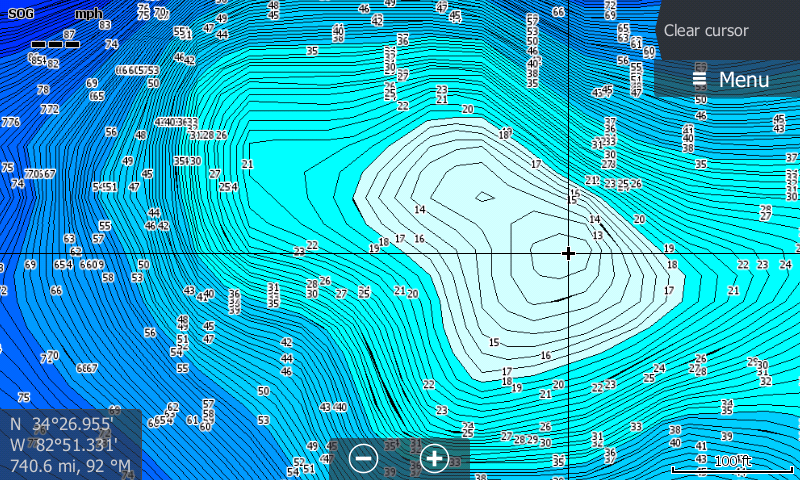 college fishing tournament after mapping 100 acres or more of the tournament waters with Insight Genesis. “One of [the] places we mapped in practice with Insight Genesis put three extra fish in the boat — one of them our biggest of the day,” says Nesbitt (left). Insight Genesis maps will show, with pinpoint precision, the “key points and breaks of humps,” which hold more and bigger fish, says Isaac Nesbitt. The ensuing images show the same hump at increasing zoom levels, bringing more detail into view. While Nesbitt idled around Lake Hartwell in practice looking at his Lowrance sonar/GPS unit for brush piles holding schools of bass and bait — a process tournament anglers refer to as “graphing” — he was simultaneously recording the sonar data his transducer was sending to his Lowrance GPS/sonar unit’s screen. All Lowrance HDS and Elite sonar/GPS units can record sonar — no additional hardware is needed, but for an inexpensive SD or micro-SD card of any brand. After coming off the water each practice day, Nesbitt uploaded his sonar recordings — called “sonar logs” — to the Insight Genesis website. The upload process is similar to, and as easy as, uploading a photo to Facebook. After his sonar logs had uploaded (it takes an hour or so — long enough to get dinner in the interim), Nesbitt could view custom maps, with one-foot contours, of all the spots he graphed during practice. Those one-of-a-kind maps showed him subtle, but important, details about the structure around the brush piles that were holding fish — details that do not exist on any other maps Nesbitt has seen of Lake Hartwell, a reservoir he has been fishing regularly for years. But because Insight Genesis creates custom maps from sonar signals sent out exactly in the places you idle over and/or fish, Nesbitt explains, your Insight Genesis maps will show, with pinpoint precision, the “key points and breaks of humps,” which hold more and bigger fish. 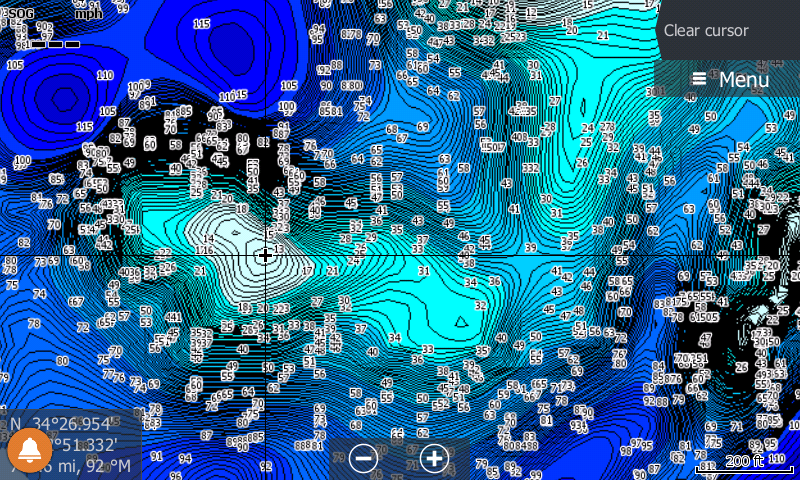 Premium Insight Genesis maps include a bottom-hardness layer that further enables anglers to quickly locate the likeliest productive spots on pieces of structure. More often that not, bass relate to hard-to-softer bottom transition areas. In this map, the orange spots identify the hardest-bottom areas on this hump. 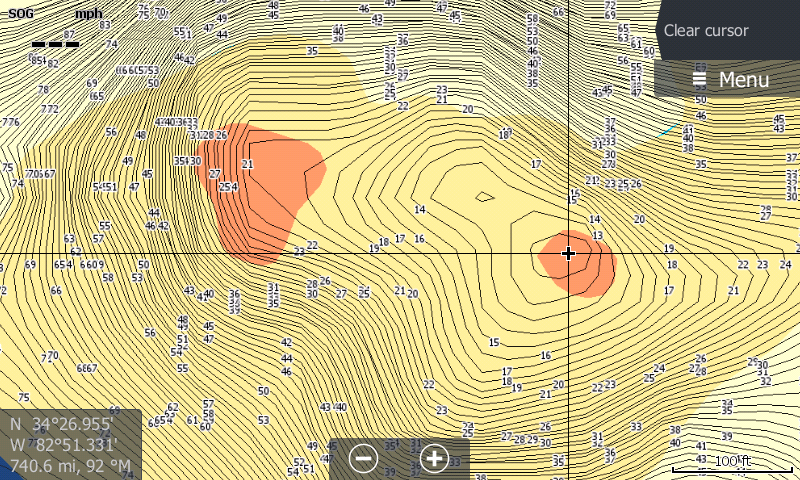 The mustard-colored area shows the next-hardest bottom content, and the cream-colored areas indicate areas of a softer bottom. 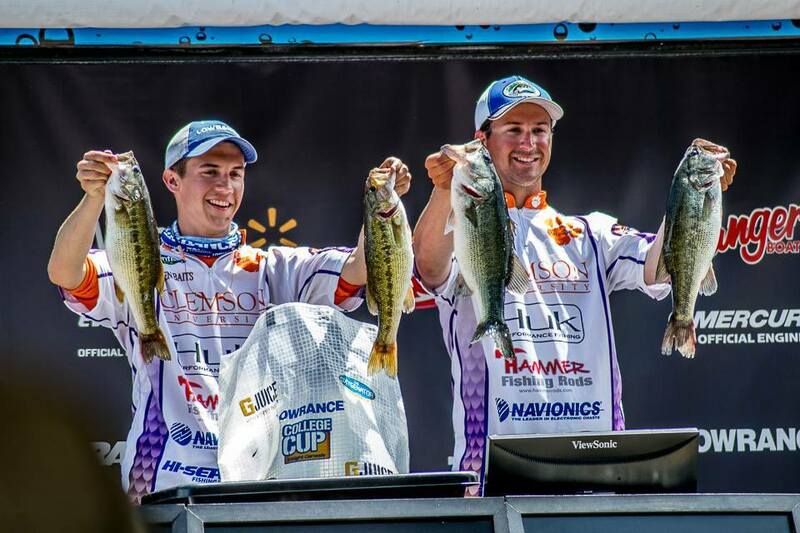 Mapping while fishing and practicing for tournaments is second nature for Nesbitt, who in the last two years has already won three Lowrance HDS Gen2 units in College Cup mapping contests. Because recording a sonar log requires you to push merely three buttons on your Lowrance unit, Nesbitt is surprised that more college anglers aren’t cashing in. 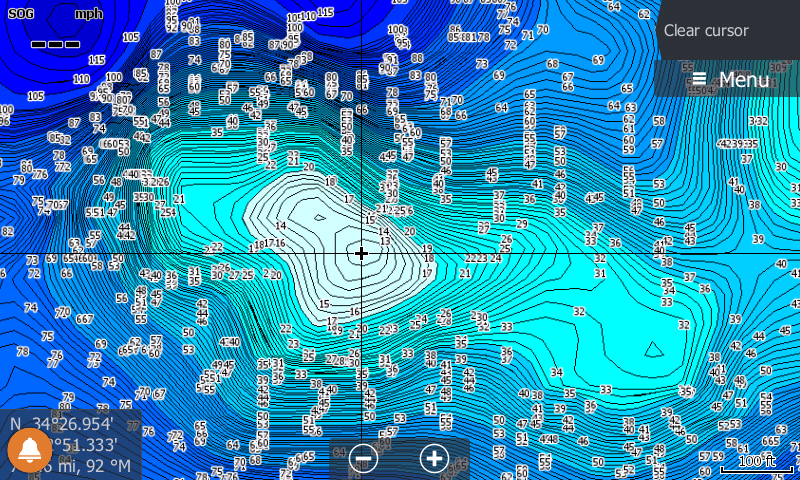 Already this year, Nesbitt has recorded 1,849 acres of sonar data on Lake Hartwell. Last year, he recorded 5,008 acres on the fishery, which was home to the 2015 Bassmaster Classic. His acres of sonar data was aggregated with sonar data recorded by other community-minded anglers to create a master map of Lake Hartwell. (That map is available for free download through the Insight Genesis Social Map). Although Nesbitt, who lives near Lake Hartwell, has marked 300-plus man-made brush and cane piles in the last couple years, not all of them are productive at all times. After taking into account seasonal-pattern trends, he was able to use his custom Insight Genesis maps to determine which brush/cane piles would be best based on conditions during the tournament. It turned out that the winning fish were positioned in and around brush/cane piles located near the edges of steep breaks, or drop-offs, on humps or points. “The bass are chasing herring now and they’ll sit and hide in brush piles and cane piles until those herring blow over, and then they go up and get them,” he says. 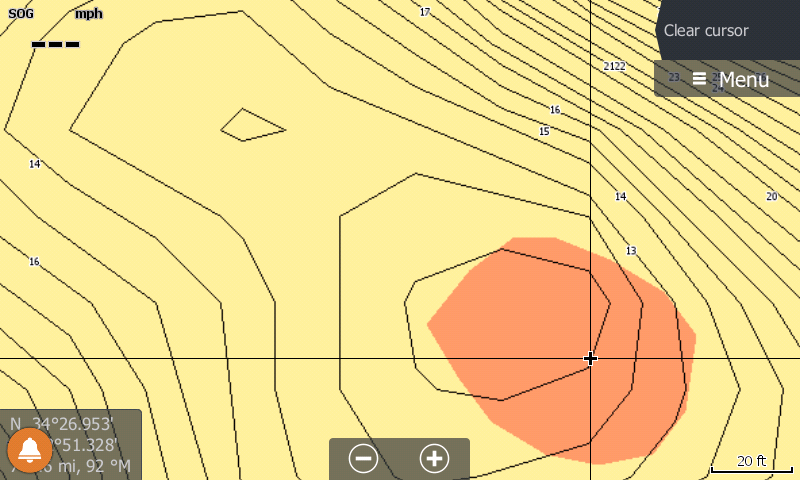 Nesbitt’s Insight Genesis map allowed him to perfectly position his boat in deeper water surrounding these areas and make identical casts to the sweet spots on them. Understanding the blueback herring’s impact on the feeding habits of Hartwell’s bass population helped Nesbitt and Burns confidently commit to throwing topwaters all day over the spots Nesbitt found with Insight Genesis. That decision resulted in victory — the first for a Clemson University team. 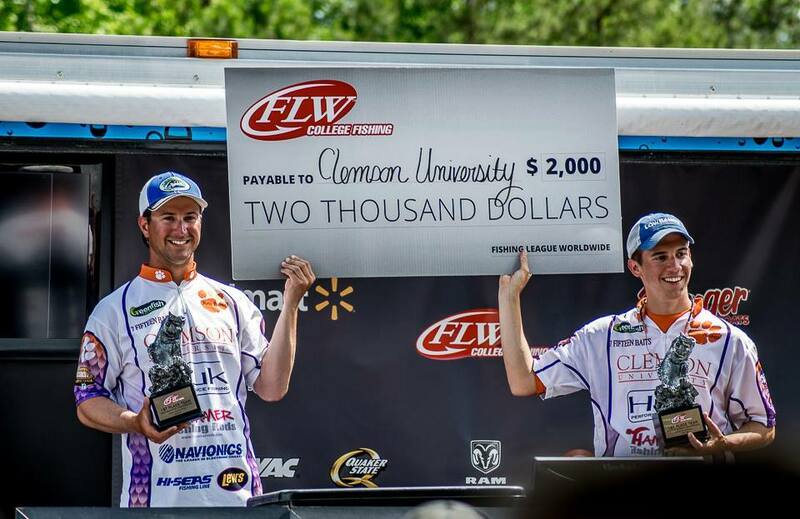 The FLW College Fishing Southeastern Conference tournament on Hartwell was hosted by the Hart County Chamber of Commerce and was the third and final regular-season qualifying tournament. Complete results can be found at FLWFishing.com. 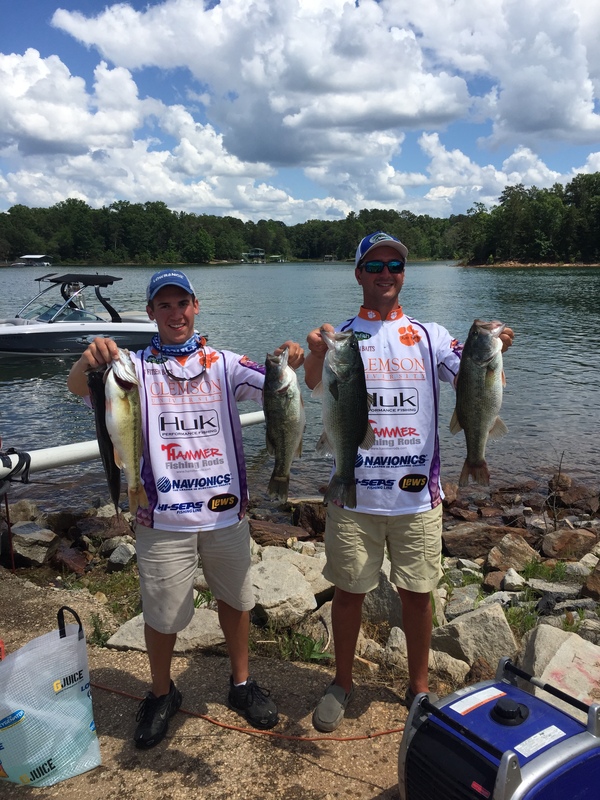 The next event for the Southeastern Conference anglers is the Conference Championship, which is scheduled for September 26-27 at Pickwick Lake in Florence, Alabama.